(Phys.org) —If you think your origami skills can't be beat – try this: (1) use the world's thinnest material, (2) make the origami fold and unfold itself, and (3) pack into your miniscule origami box enough hydrogen atoms to exceed future U.S. goals for hydrogen energy storage devices. Researchers from the University of Maryland have done all three. Graphene is the world's thinnest material, just one atom thick. 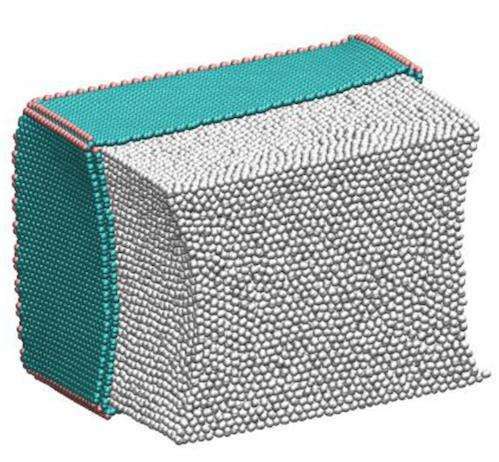 Mechanical engineers Shuze Zhu and Teng Li have found that they can make tiny squares of graphene fold into a box, which will open and close itself in response to an electric charge. Inside the box, they've tucked hydrogen atoms, and have done so more efficiently than was thought possible. According to the U.S. Department of Energy (DOE), hydrogen storage is a key enabling technology for the advancement of hydrogen and fuel cell power technologies in transportation, stationary, and portable applications. The DOE is searching for ways to make storing energy with hydrogen a practical possibility. Department goals include: by 2017 development of techniques that enable packing in 5.5 percent hydrogen by weight, and by 2020, stretching this achievement to 7.5 percent. Li's team has already crossed those thresholds, with a hydrogen storage density of 9.5 percent hydrogen by weight. The team has also demonstrated the potential to reach an even higher density and doing so is a future research goal. "Just like paper origami that can make complicated 3-D structures from 2-D paper, graphene origami allows us to design and fabricate carbon nanostructures that are not naturally existing but of desirable properties," said Li. "We have made nano-baskets, as well as these new nano-cages to hold hydrogen and other molecular cargos." - pack these in a 3D structure. ..and you get a storage unit than can release predetermine amounts of hydrogen (or be selectively refilled)...as well be extremely resilient against even the most severe impacts (only those cubes that are physically breached would actually release their content)? Sounds pretty good if you ask me. I wonder what the results are at room temperature. These kinds of storage solutions usually work at super cold temperatures. This instability has not proven to be a problem with the HAGO boxes. "Much effort has been dedicated in this research to demonstrate the promising feasibility of the HAGO process, including its robustness to possible manufacturing defects and stability at room temperature,"
But you'll probably want to cool the hydrogen to pack more of it in. "by 2017 development of techniques that enable packing in 5.5 percent hydrogen by weight, and by 2020,"
By 2020 hydrogen fuel cell technology will probably be all but gone. Multiple battery designs are reaching production viability. Volkswagen alluded to testing batteries 4 times the energy density than the state of the art. Tesla's building a giant factory to bring down battery prices. Others will follow as soon as EVs gain a bit more momentum. All scientific and technical research at American institutions seems to be conducted by Chinese nationals. By 2020 hydrogen fuel cell technology will probably be all but gone. Think airplanes. Think shipping. Not likely they'd go for batteries - but they might go for something that requires hydrogen storage. Then think about large scale buffer systems for the energy grid. There's certainly applications out there for several types of energy storage. Well, if the people born there are stupid you can't do anything else. That is not the issue. You know full well why people want to replace petrol (and why methane isn't an optimal replacement, either). And if that replacement means that the efficiency will be a bit lower - so what? Today there is more to an energy source than efficiency: We want it also to be sustainable. Bah. Learn to read, and understand... You don't know what methanol is, jeez... It's most certainly not methane. It's liquid, doesn't require crappy cryo/high-pressure tanks and fuel cells already exist for it. Also you failed at comprehending that it's synthesisable. I doesn't change the fact that fuel cells only have place where energy density is critical like aircraft. Even there batteries might make them obsolete. Molten-air batteries have competitive energy density they might be more produnt to use eventually, regardless of the complication at keeping them at temperature and providing air. You don't know what methanol is, jeez... It's most certainly not methane. It's liquid, doesn't require crappy cryo/high-pressure tanks and fuel cells already exist for it. Methanol is today mostly produced from methane - which in turn is, if we're talking industrial scale applications, currently sourced as a fossil fuel. So unless we use some other, viable source for methanol (that'd scale to the kind of quantities we'd need) it's a tricky solution. and fuel cells already exist for it. From what I gather these are somewhat less efficient.